The weather was very good with moderate temperatures and overcast skies. There was a large turnout and I got one good car story. 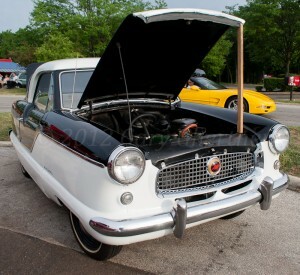 About five years ago, the owner of this ’61 Nash Metropolitan went to Rockford to buy one of these models. Of the two at the Clock Tower Inn event, the black and white one was the better choice. However the buyer only had $ 50 in his pocket and the seller wouldn’t wait until Monday when the banks opened. So the car was trailered 300 miles to a ‘difficult to find’ Kentucky horse farm. So the purchaser drove to the Bluegrass state with his trailer and money in 95 degree heat to pick up his ‘new car’. But the Metropolitan wouldn’t start (perhaps vapor lock) so the buyer and seller had to manhandle the 1300 pound vehicle onto the trailer as both were soaked with sweat. My photo gallery for this event is online here. This week’s band was The Sting Rays, “Chicago’s Oldies Band“.